Moving 'Beyond Katrina' Through Poetry And Prose In a powerful memoir, Pulitzer Prize-winning poet Natasha Trethewey surveys the storm-battered landscape of the place she once called home. Beyond Katrina is a powerful meditation on things long gone that will never come back. On one of her trips back to the Mississippi Gulf Coast after Hurricane Katrina, Pulitzer Prize-winning poet Natasha Trethewey noticed a sign in front of a Baptist church emblazoned with this command: "Believe the report of the Lord. Face the things that confront you." As she surveys the storm-battered landscape of the place she once called home, Trethewey takes those words to heart. Like the gifted memoirist she proves to be in the pages of Beyond Katrina: A Meditation on the Mississippi Gulf Coast, she indeed faces and confronts demons from her past and the present. The result is a book as moving and compelling as Trethewey's poetry. "When we begin to imagine a future in which the places of our past no longer exist, we see ruin," Trethewey writes. The ruin and destruction Trethewey reference move beyond the eroding beaches and ancient uprooted live oak trees that line the Gulf Coast. What she explores with emotional depth and sensitivity is the psychic toll Katrina has taken on her family and on the community they live in. It's been five years since Hurricane Katrina hit the Mississippi Gulf Coast and New Orleans. Without a doubt, this fall will bring a number of books to a growing body of literature on this disaster. 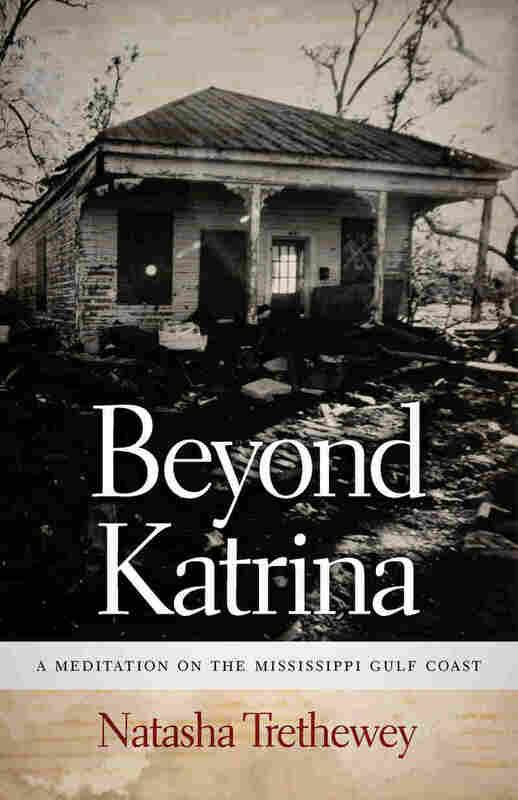 What makes Beyond Katrina stand out in the crowded landscape of post-Katrina literature is the raw, personal nature of the story Trethewey tells, as well as the poetic language she uses to tell the tale. She moves the reader beyond the uplifting narrative of rebuilding represented by each new, glitzy casino along the shores of the Mississippi Gulf, beyond the gambling palaces, and a few miles up Highway 49 into the working-class, African-American, North Gulfport. As a girl, Trethewey spent her summers in North Gulfport with her grandmother. Her brother Joe came to live in the town after his father — Trethewey's stepfather — murdered their mother. Although her grandmother must have seen her daughter's murderer when she looked at Joe, the family somehow found a way to look beyond that personal tragedy. Perhaps to counter this perception, Joe seems to assume the persona of her grandmother's beloved brother, Son Dixon — a legendary nightclub owner and African-American entrepreneur — and immerses himself in his Uncle Son's business of owning and renovating shotgun houses in North Gulfport. Before Katrina, Joe's life and business is on track. After Katrina, forces of nature and circumstance lead to his imprisonment. To tell the story of Joe's attempt to rebuild his life and the simple tragic act that leads to his incarceration, she mixes prose, poetry, personal letters and what few childhood photographs survived the storm. Beyond Katrina is just what the subtitle says it is: a meditation. But within this book's quiet thoughts lies a powerful story of things long gone that will never come back. What is lost can only be captured by memory. And Trethewey's prose captures memory with poetic precision. Somewhere in the post-Katrina damage and disarray of my grandmother's house is a photograph of Joe and me -- our arms around each other's shoulders. We are at a long-gone nightclub in Gulfport, The Terrace Lounge, stand¬ing before the photographer's airbrushed scrim -- a border of dice and playing cards around us. Just above our heads the words High Rollers, in cursive, embellished -- if I am remembering this right— with tiny starbursts. It is 1992, the year the first casino arrived on the Mississippi Gulf Coast and, with it, a new language meant to invoke images of high-stakes players in exclusive poker games, luxurious suites on the penthouse floor, valet parking and expensive cars lined up in a glorious display of excess. Scenes from a glamorous casino someplace like Monte Carlo or Las Vegas -- nothing like the gravel parking lot outside the club, the empty lot beyond it, and the small, run-down houses on either side, each with a chained-up dog barking into the night. Not far from the club, beyond the spot that held the old Gulfport City Limits sign, is the neighborhood my ancestors settled in when they arrived on the Gulf Coast. Roughly five miles from the beach and downtown, the place called North Gulfport was once the northernmost settlement beyond the city. Now, it occupies a middle ground in Gulfport, though -- until just recently -- the city of Gulfport's annexation of outlying districts had skipped the entire area to incorporate the white and affluent residential neighborhoods that had developed, due north, beyond it. One of two historically African American communities that sprang up along the Mississippi Gulf Coast after emancipation, North Gulfport has always been a place where residents have had fewer civic resources than those extended to other outlying communities. Isolated and unincorporated, North Gulfport lacked a basic infrastructure: flooding and contaminated drinking water were frequent problems. Although finally incorporated in 1994 -- not long after the arrival of the first casino -- many of North Gulfport's streets still lack curbs, sidewalks, and gutters. Before the arrival of the casinos brought tourists down Highway 49 toward the beach, there were few streetlights and North Gulfport was cast in darkness. In recent years, as developers have acquired land in the community for commercial purposes -- as the city has redistricted homesteads as commercial rather than residential property -- many elderly citizens have lost their homes. Higher property taxes have forced people out even as property values have declined. For Sale signs abound, and developers seeking to fill in the nearby wetlands continue to threaten the environmental safety of North Gulfport's residents. Highway 49, rerouted and expanded after World War II, long ago cut the community in half. According to an article published in the July/August 2005 issue of the National Housing Institute's Shelterforce magazine, in a state as poor as Mississippi, residents in North Gulfport face "even higher rates of poverty, land loss and housing abandonment than the state average." When I was growing up there, North Gulfport was referred to as "Little Vietnam" because of the perception of crime and depravity within its borders -- as if its denizens were simply a congregation of the downtrodden. Even now, it is a place that outsiders assume to be dangerous or insignificant -- run-down and low income, a stark contrast to the glittering landscape of the post-Katrina beachfront with its bright lights and neon bouncing off the casinos onto the water. Were North Gulfport not along the main thoroughfare, making it necessary to drive through to get to the beach, it might be easily forgotten. Now, because the city is invested in improving that stretch of Highway 49, some residents face losing the right to make decisions about their own property. This problem is foremost in Cicero Tims's concerns about the post-Katrina political landscape. "I've had to start over several times in my life when every¬thing I had was destroyed. This time, the city won't let me rebuild my business the way I want to. This old shack that my snowball stand is in -- I can't even tear it down to build a new one. If I tear it down, the city takes the land. I'm only here now because of the grandfather clause. If your business was here before a certain date, you can keep your property. But if you tear it down to do something else, it's gone. "I've been out here a long time. I remember when your uncle built his nightclub right over there. He was one of only three people out here who had a Cadillac. Owned the ball team too. A high roller -- he bought Lizzie that pink Cadillac. I owned a motel back then, and all the colored acts had to stay in it. Son Dixon booked them at his club, and they stayed with me. I did a good business -- until they desegregated the white hotels. Before Katrina, the worst thing that happened was desegregation. I lost all my business. Had to shut down the motel. You know where it was -- back over there, off old Highway 49." I'm stunned at first that he has fond memories of a segregated Gulfport, but then I realize that he's speaking figuratively, and I can see the comparison he's making. He's a man who is proud to have put all his children through college -- at integrated institutions. Yet his nostalgia about the days of Jim Crow implies that the alternative hasn't always benefited poor and low-income people equally and that reforms that should help all members of a society still privilege some people over others. Rather than simplifying the idea that desegregation was immediately and equally good for everyone, he focuses on the nuances of what some people lost: how suddenly owners of white hotels were able to benefit from the revenues brought in by black consumers at the same time black business owners were losing those customers. Whatever economic base the community might have had because of local businesses began to evaporate when they could no longer afford to stay open. And without a good tax base, the community would receive fewer resources from the city. In his nostalgia for a past in which he had a viable business, he underscores the ongoing discrepancies that have plagued the rebuilding effort on the Gulf Coast. Excerpted from Beyond Katrina by Natasha Trethewey. Copyright 2010 by Natasha Trethewey. Excerpted by permission of the University of Georgia Press.